According to RBI data, 90% of all transactions in India are made with cash. A little over 80% of this cash became practically useless overnight after Rs1000 and Rs500 currency notes were demonetized on November 8 this year. This withdrawal of legal tender status of these notes came as a major blow to traders who rely mainly on cash for business transactions. Kashmere gate in old Delhi, one of India’s largest wholesale markets for auto parts, which is overcrowded on any usual day, wore a completely deserted look for the days after November 8. Business in other auto components wholesale markets across the country also tanked. An examination of the impact of this unexpected event (described as a Black Swan1 by many), threw up some interesting observations about two sets of spare parts manufacturers in the aftermarket. In the week following November 8, there was an immediate slump in sales of a few companies. In a few others, there was no perceptible change (compared to sales of the same period of previous years). But by month end, the trend reversed. Business hopped back to normal (or in some cases improved) for the first set of companies while the second set suffered a severe hit. Industry reports indicate that, not only are the latter looking at abysmal numbers for the month, but are also anxious about the top line for next two quarters. Yes, two sets of companies in the same environment had drastically different experiences of the same circumstances. Why? Let’s take a closer look. The difference lies in whether the supply chain of the company is managed by ‘push’ method or TOC ‘pull’ replenishment systems. The ones that are managed with a pull-based supply chain appear to be anti-fragile2! Demonetization created a drought of currency in the market. Our study showed that traditional companies operating on push systems felt little or no impact immediately. These organizations have a typical sales pattern. The first couple of weeks see very little sales. It picks up in the third week and peaks at the month end. When the market was reeling under the aftermath of demonetization, these companies remained relatively unaffected since the level of activity at that time of the month is usually not high. But when the month end approached and their channel partners refused to pick up the anticipated stock, all hell broke loose! The first links in the channel for most companies are distributors, wholesalers or dealers. Since most of the cash with retailers was in the demonetized currency, they rushed to distributors and wholesalers to get rid of the old currency by paying their dues, clearing overdues and in some cases even paying in advance for purchases to be made in the future! Unfortunately distributors could not do the same with companies. Though the distributors and wholesalers became flush with cash, they could not deposit this bounty in their accounts as the banking system was almost paralyzed. So despite having cash, distributors and wholesalers did not have “money” to clear dues. Thus they were unable to buy more stock from companies as their billing accounts were under lock (a fairly common occurrence). Consequently, the primary sales of companies was hit badly. On the other hand, companies operating with TOC “pull” replenishment systems are having a different experience. In the TOC pull replenishment method, retailers or distributors are only supplied to the extent to which goods have moved from them due to consumption. Orders are placed daily at all nodes and replenished frequently. When the market was in shock and consumption was almost frozen for a few days, the signals of this decline immediately reached the companies. But sales picked up once the initial pall was over and consumption resumed (albeit at subdued levels), even without any incentives or credit extensions. Since retailers in this system have very little possibility of their money being locked up in excess stock (as they are not required to buy in bulk), they preferred to use whatever liquidity they had to buy small lots needed to service customers. Moreover, unlike traditional companies whose availability took a big hit because of distributors’ inability to buy, the availability of products of TOC companies remained high. According to numerous accounts, this advantage of high availability and the willingness to supply small lots actually prompted some retailers to substitute products that they had traditionally sourced from other companies to these firms, leading to a shift in market share – shop by shop, SKU by SKU. 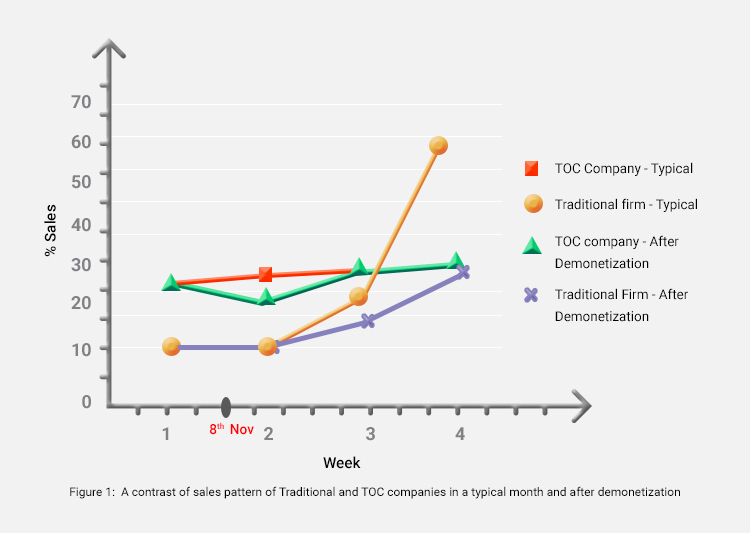 Now, while it’s business as usual (or near usual) for TOC companies, sales has seen a significant de-growth (20-30% reduction according to various reports) for many traditional companies. The result is an increasing pile of finished goods in warehouses. Industry reports indicate that companies are reacting to this by increasing credit limits and credit periods for channel partners and offering extra discounts. This knee jerk reaction can prove counterproductive. Distributors are already in a dicey situation; they are unable to pay dues. They are also burdened with inventory (pushed to them in the past). As companies are doing the distributors a favor by extending credit cycles, they would set tough terms. Chances are they will push stock with more ‘strangers’ than ‘runners’. Consequently, inventory with distributors would pile up further. Channel partners too would be choked with inventory and would start straining at even their extended credit limits. If they are unable to pay for this inventory and are also unable to clear their earlier dues, they may go into credit lock. Companies may then have to resort to strong arm tactics of “pay or no supply”. So while the distributors’ money is stuck in not-so-fast moving goods, and with no cash to buy runners, there will be a scarcity in the market for these. Since significant amount of sales tend to be of these runners, the retailers already reeling under a cutback in consumption will experience a further fall in sales due this supply issue. The net result is vicious circle of reduced sales and ballooning working capital for the manufacturers and its channel partners. The supply chain strategy not only has an impact on how the trade channel will fare but will also decide how companies weather the aftermath of this particular storm! Unlike companies managed with TOC philosophy, traditional companies tend to have huge piles of finished goods (more than four to six weeks). History has shown that, if sales remain below expectations for a protracted period, companies would be compelled to cut production by block plant closures. Reduced sales also mean that the collections of gross contribution (sales – truly variable costs) would not be adequate to pay for total periodic expenses like salaries, rent, etc. Companies also have to pay for raw material currently lying in finished goods (lying in the automaker’s own warehouse or at the dealers/distributors). They will then feel compelled to throttle both orders and payments to vendors. Consequently, they will end up with huge finished goods inventory of some products which are not selling fast and will be short of components to produce runners which can sell immediately. This, of course, will further hinder the flow of liquid money. Without orders, production cuts by companies will be amplified by production cuts by suppliers (who also have finished goods). Suppliers would then be forced to downsize or give workers long breaks, which can be a huge risk as they may not get them back when required. This may affect both their business and that of their customers. Most companies are prisoners of an erroneous model of supply chain management. The paradigm ‘the more one pushes, the more one sells’ is flawed. The “push” model locks working capital in non-moving stocks and prevents distributors from buying more of moving stocks. This model is not effective even in stable markets. But whenever there are ‘black swan’ (high-impact, hard-to-predict, and rare events) events or even “Grey swan” events like 2008 recession, Jat unrest (Feb 2016) carvery water unrest (Sept 2016) or now demonetization (Nov,2016), this method of operating makes companies particularly vulnerable. The industry has experienced it over and over again. So, how can companies become anti-fragile using the TOC philosophy, i.e, how can they not only survive such random events but also thrive? To answer this, let’s ask a few more questions. What if the factories produced only according to what was sold? What if companies had an inventory of about 15 days at the dealers and 10 days at their own central warehouse and the central warehouse supplied to the dealers only what they sold? And the plant in turn only produced quantities equivalent to what was sold from the central warehouse? Would the situation of cash crunch be so severe? But for 10 days of inventory in central warehouse to be enough to prevent unavailability (lost sales), the plant has to be capable of delivering in less than 10 days. Can this be done? Let’s assume raw materials will be available in the raw material stores of producers or as finished goods with the component suppliers. With this support, the plants (component manufacturers) can replenish the central warehouse in not more than 5-7 days. If the central warehouse has near 100 percent availability and the distributors/s dealers provide daily sales data, the inventory required at the distributors/dealers is dependent only on the delivery times. With frequent replenishment at all nodes, the entire supply chain can thus work to real consumption! Such a “pull” mechanism in the supply chain will ensure that the company is not blindsided when there are market declines for whatever reason. Moreover, the inherent agility of the system will also make sure that the company is best poised to take advantage when the market bounces back. Research shows TOC companies that acquire market share this way tend to permanently retain it even after the period of turbulence is past. It is as Seneca said “Good Luck is when preparation meets Opportunity”!! 2A term introduced by by Nassim Nicholas Taleb in his book by the same name to describe “some things that benefit from shocks; they thrive and grow when exposed to volatility, randomness, disorder, risk, and uncertainty”.